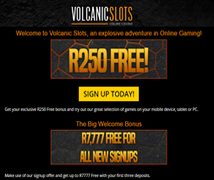 Volcanic Slots is a South African Casino that uses the Habanero Gaming Software. Volcanic Slots Casino was established in 2016 and has proven to be a new favourite casino enjoyed by South African players. They accept Players from South Africa and Deposits can be made in South African Rand. Volcanic Slots is an entertaining and popular online casino with excellent gaming options. The audio and 3D graphics are world class and the games offer lucrative winning opportunities. Volcanic Slots proudly offers games with the very latest in gaming technology. The full package of games is available on pc, mobile devices and tablets. A positive feature is there is no difference in the list of games available on different devices. All types of players will find a game of their choice from video slots to table games and video poker. Take advantage of the Welcome Bonus, sign up and start playing today! Payments are processed through Volcanic Interactive Ltd.
100% up to R7 777 Instant Bonuses over First 3 Deposits! 50% up to R2 500 on 3rd Deposit! Other Currencies: Volcanic Slots also accepts Players from Many Other Countries, Including Australia. Volcanic Slots uses Habanero Systems gaming software which features exciting themes, captivating graphics with 3D animation and ambient casino sounds. The games are constantly updated and new games get added on a monthly basis. Habanero Systems has become known for their full suite of casino software including table games, video poker, and a variety of video slots. The games are developed in the HTML5 format, although some older games use the Flash platform. The games work seamlessly across all devices and can be played in portrait and landscape on mobile. Play multiple games simultaneously with various RTP percentages per slot game. Visa, Mastercard, Neteller, Skrill, POLi, EasyEFT, Sofort, FNB Bank Account. The collection of unique slots features different themes which have been individually designed to ensure a high quality of immersive gameplay, sounds and 3D graphics. Every slot is linked to 3 Progressive Random Jackpots which can be won at the end of any game. Player’s don’t need a winning combination to trigger the Mini, Minor or Major Jackpot. Double Bonus Poker, Jacks or Better, Joker Poker, Tens or Better. Volcanic Slots Casino offers some great weekend bonuses with excellent rewards. Loyalty Points can also be accumulated which may be redeemed for cash.